Your backyard should be a source of great enjoyment if you have a swimming pool. After all, with the cost of installing one and how much it takes to keep one functional, a swimming pool you don’t enjoy is really just a money pit! However, a lot of homeowners find themselves with swimming pools that they no longer like after living in a home for a while, or because of their looks. That doesn’t have to be the case, as with a few simple creative tips you can easily transform it into a new hangout space. Use these six tips to help you beautify your backyard swimming pool with ease. A pool without enough seats is basically worthless when people aren’t swimming. Make sure you have seating and lounge chairs for all of your guests. Comfortable lounge chairs are ideal for people who mostly use their pools just with family. Using similar materials inside and outside can make your pool feel like part of your home. Consider doing things like bringing stone from inside out to your patio, or you can also build a deck. A pool area that’s dark at night isn’t very exciting to use. Add movable lighting like tiki torches and lighting that’s fixed in place like solar lawn lights in nearby areas. Water features can use water in your pool and little power. They add lots of visual appeal to your swimming area though. Decorative rocks give definition to a swimming area and keep kids from running. Add a few to your backyard swimming area for a whole lot less money than you might think. If you have grass around your swimming area, it might be time to re-sod. Improve the way your grass looks to make the whole area delightfully scenic. 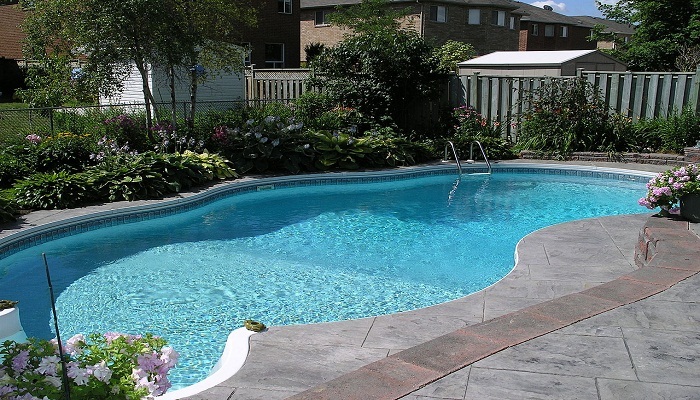 here are six amazing tips to deck up your backyard with a swimming pool. This entry was posted in Fencing Guide, Pool Fencing and tagged Backyard Swimming Pool Designs, Swimming Pool Design Ideas. Bookmark the permalink.